Looking for a mobile phone mount to suit a car, bike or any other application? These simple to use and adjust products from RAM Mounts are perfect for any vehicle or environment. 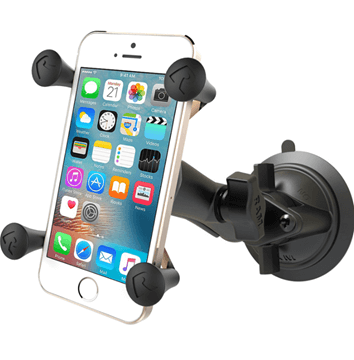 The RAP-B-166-UN7U consists of a 3.3" diameter suction cup twist lock base, double socket system and universal spring loaded X-Grip® cradle for cell phones. The RAM X-Grip® by RAM Mounts has a clean and clever four leg design that sports great holding power without hiding your phone behind foam pads and plastic. Get the RAM-HOL-AP6U RAM Cradle Holder for iPhone 3G/3GS from Hummingbird Electronics' great range of RAM Phone Mounts online. The Cradle Holder for iPhone 3G/3GS is the perfect addition to your set-up for your next adventure.